Number 1 for First Birthday, in polystyrene, choose colour and size. The polystyrene number 1 is a type of 3D inscription, ideal for setting up the environment in which to celebrate the first birthday of your child. 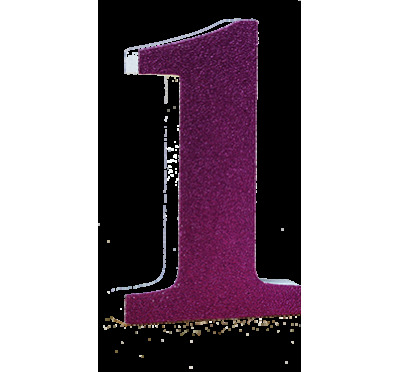 The number 1 for First Birthday is available in two different variations (with blue or fuchsia glitter), and in different sizes. Choose the one that's right for you! The polystyrene number 1 is a glittery mould that can be used both in the art of cake design to decorate a birthday cake, and to embellish the environment in which to celebrate the birthday party. The polystyrene number 1 is a 3D decoration depicting the number 1. These numbers are made of polystyrene and are widely used as an ornament for children's birthday parties. During the first party of your child, in fact, this polystyrene number 1 if placed on the table where the child will turn off the candles for the first time is a nice decoration. Thanks to this decoration, even the photos of your child's first birthday will be colourful and special. Thanks to the particularity of the polystyrene to be resistant and durable over time, parents of children can keep this polystyrene number 1 for as long as they wish. In fact, the polystyrene of which the Number 1 is composed is very resistant and able to last for a long time. 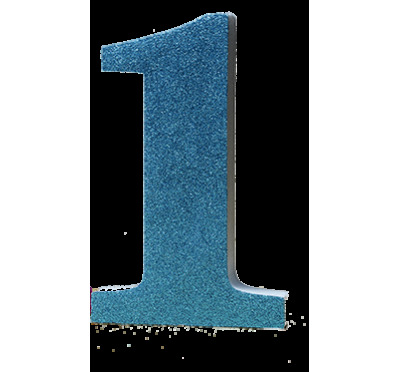 Therefore, after using the Polystyrene number 1 as a decoration for your child's party, this number can be displayed on a shelf in your child's bedroom. These adorable 3D decorations have a glitter-covered front. 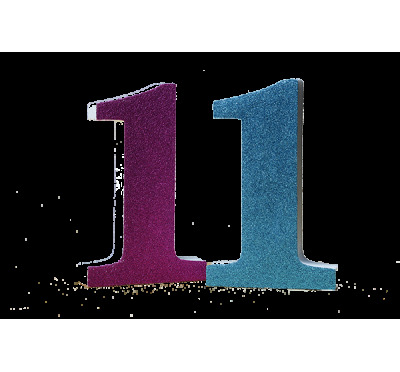 The number 1 glitter is available in two colours, blue and fuchsia, in order to be used both for the first birthday of a boy and for the first birthday of a girl. The polystyrene of this Number 1 glitter is a highly transpiring and insulating material; therefore, it does not allow the formation of bacteria. Because of this amazing characteristic, it can also be a decoration for the birthday cake. In fact, if placed on top of a flat cake will increase the amazing effect of the monumental cake. Often the master confectioners skilled in the art of Cake Design, or the decoration of the cakes following the American tradition, use the numbers in polystyrene to garnish the Dummy Cake, that is to say fake cakes made of polystyrene bases coated with sugar paste and used as a showcase display for cake design shops or for confectioners. These fake cakes are very durable so they can beautify the shop window for a long time. In short, both if they are used as an ornament of the party, and if they are used as decoration for birthday cakes, this Number 1 glitter is a fantastic element to celebrate the party of your child. Number 1 in polystyrene in variety of sizes is of excellent quality. Our company with years of experience in processing and manufacturing of polystyrene can boast the high quality of its products. Our catalogue of Number 1 in polystyrene in variety of sizes offers two different variations (with blue glitter and Fuchsia glitter) and different sizes to better adapt to your needs. You can choose Numbers 1 with heights of 12 inches, 15.75 inches and 19.75 inches and widths respectively of 7.5x2 inches, 10x2 inches and 12.25x2 inches.